My huge box of Chick-O-Sticks surrounded by wrappers old and new. In the world of candy, there are the “straight” candy bars that basically offer something tasty to eat (like a Hershey bar), and then there are the “fun” candy bars that remind you of childhood and summer vacation. Chick-O-Sticks are one of the fun ones. They look like a long stick of fried chicken, but taste of crunchy peanut butter and coconut. When I was a kid, their wrapper featured a merry chicken wearing a cowboy hat. I always wondered what the connection between chicken and candy was. The mystery added to the allure. I figured that when I got older and wiser, I would finally understand. As it turns out, I finally got the answer… just took a few decades! 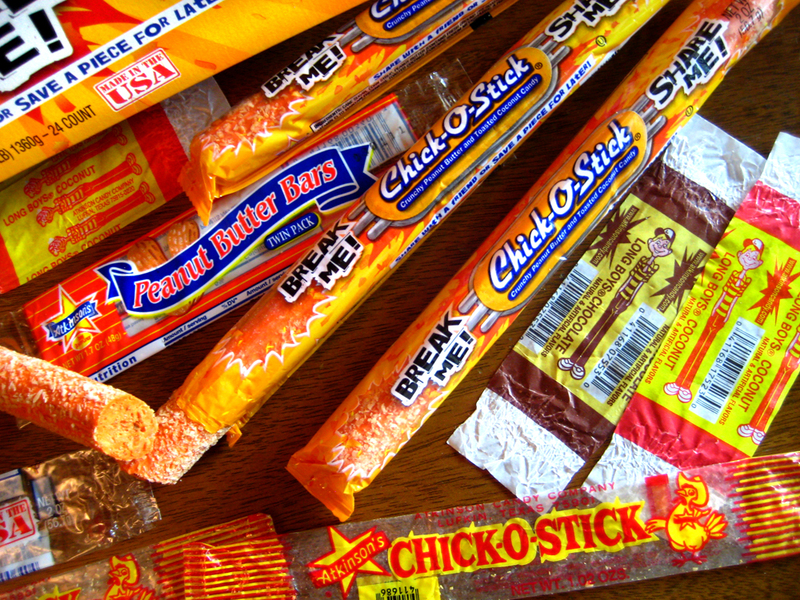 The Chick-O-Stick is made by the Atkinson Candy Company in Lufkin, Texas. They make other classic candy, such as caramel Long Boys and crunchy peanut butter bars. Atkinson’s has been in business since the 1930s and is one of the few candy companies to survive and thrive without being subsumed by Hershey, Nestle, or Mars. As the curator of The Candy Wrapper Museum, I was excited when Nick Reynolds from Atkinson’s contacted me with news about their new wrapper and ad campaign. Nick sent me a huge box of the new Chick-O-Sticks with their new slogan, “Break Me! Share Me!”, which I photographed alongside my vintage wrappers for comparison. Incidentally, during this photo shoot, my dog King went nuts over the aroma of the peanut butter. I now have to hide the box in the pantry; otherwise, he starts whining for them while giving me his best doxie Svengali stare-down. A closer look at Atikinson’s candy wrappers over the years in the Candy Wrapper Museum. What’s the new slogan and wrapper about? I got the answer to that question and more in this interview with company president, Eric Atkinson. Could you give me a brief history of the Atkinson Candy Company? Atkinson Candy Company is eighty years in business; started by B.E. Atkinson Sr. in 1932. It was the great depression and nobody had any money but everybody had a nickel. We began as a Candy and Tobacco wholesaler but by 1938 we were making candy. In 1950 the wholesale operation ceased and we became full time candy manufacturers. When was the Chick-O-Stick invented? Did it require any special technology? As early as 1938 we were making a peanut butter stick. Back in those days, the Chicken Bone was a popular confection produced be a few companies across the country. B.E. knew all he needed to do was add a little color and roll the peanut butter sticks in coconut and voila; you have a Chicken bone! The only special technology it takes to make a Chick-O-Stick is a good candy maker! Has the Chick-O-Stick changed over the years? One of the coolest things about a Chick-O-Stick is the fact that it is made exactly the same way it was back in the forties and fifties. The source of the ingredients has changed over time but they are still handmade today at the same factory and 25% of each piece is fresh ground peanuts. How does Atkinson’s stay competitive against big companies like Hershey? An unwavering commitment to making a quality product, quality customer service, strong and regular promotions, a dedicated national sales force, national distribution for over fifty years. Also our candies are unique and different to Hershey’s offerings with the exception of the Zagnut bar. We just make a superior piece of candy than they do and the consumer has come to know that. 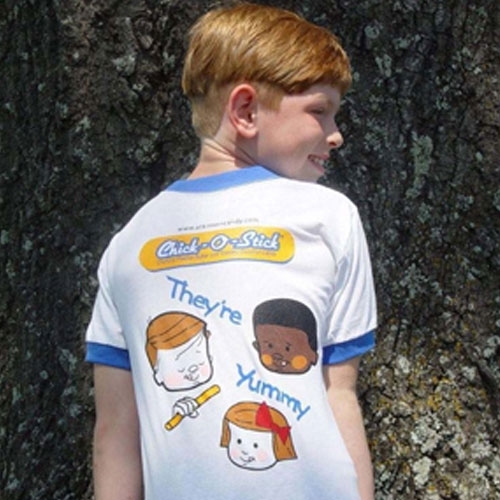 What’s the story behind Chick-O-Stick’s new packaging? Two things: first, the breakage. A) The candy is light and crunchy but in a long stick, that means it is breakable. Knowing that and knowing we wanted it to maintain its delicious texture, we decided to embrace the break: if you can’t beat it, join it! You have to break it to eat it or to share it with a friend anyway so why not?! B) shelf life; the new packaging represents a move away from cellophane to BOPP; a vastly better vapor and moisture barrier that will easily take our shelf life out to nine months and more so a Chick-O-Stick will stay fresh and delicious. Another view of the old and the new. I noticed some cool T-shirts on your site. Are they 100% cotton? What kind of a company would put their stuff on rayon?! This company still has its soul and you’ll only find 100% cotton in our T-shirts! Click on the vintage wrapper to visit Atkinson’s site. Thank you, Eric and Nick! 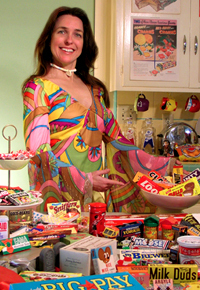 Darlene is the author of "Classic Candy: America's Favorite Sweets, 1950-80" and curator of the Candy Wrapper Museum, which is comprised of her personal collection which she began as a teenager in the 70s. The CWM has been featured in numerous TV shows, magazines, newspapers and blogs, and made its art gallery debut in 2010 at the Scion Space's "Palate" show. This entry was posted in Food, Interviews and tagged Atkinson Candy Company, Atkinson's, Chick-O-Stick. Bookmark the permalink. Excellent article! 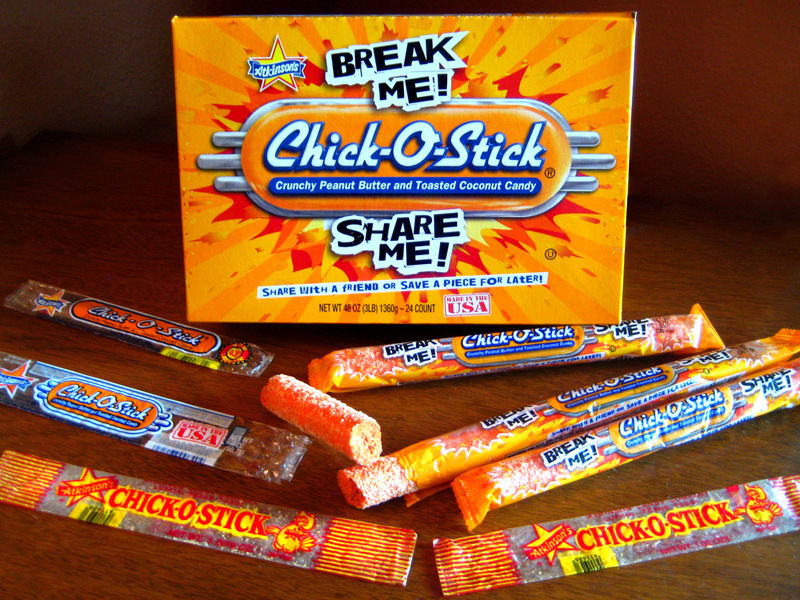 Having grown up in East Texas, Chick-O-Stick was a part of my childhood. I plan to eat more Chick-O-Sticks! That is a delicious article and interview. Heading to the candy store right now! Wildly informative article! 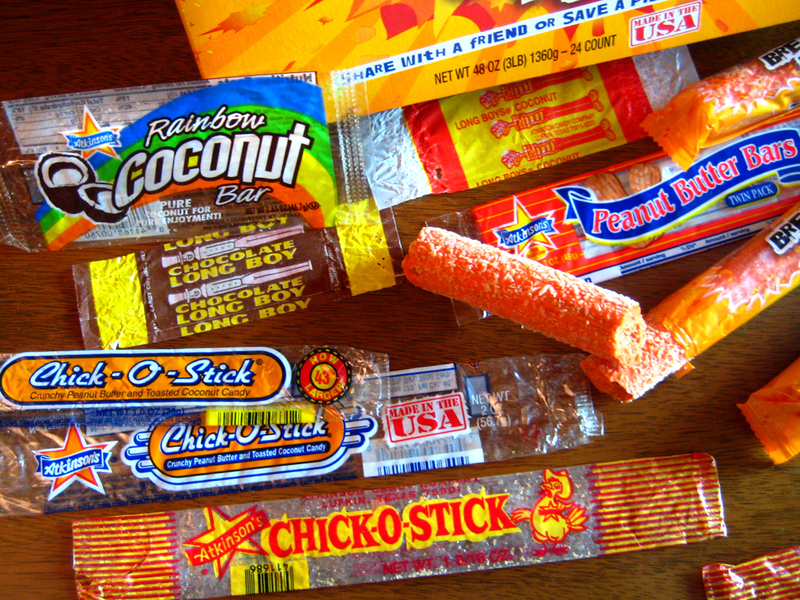 I was not cognizant of Chick-O-Sticks until this day, but they look delish, and the wrappers are enrapturing. Candy made in the USA and superior to Hershey’s? Whoa! Must try. I love Chick-o-Stricks. My favorite Candy.